Almost three-quarters (74%) of smartphone owners get real-time location-based information on their phones as of February 2012, up from 55% in May 2011. This increase coincides with a rise in smartphone ownership overall (from 35% of adults in 2011 to 46% in 2012), which means that the overall proportion of U.S. adults who get location-based information has almost doubled over that time period—from 23% in May 2011 to 41% in February 2012. Meanwhile, more smartphone owners are using geosocial services like Foursquare or Gowalla1 to “check in” to certain places and share their location with friends. 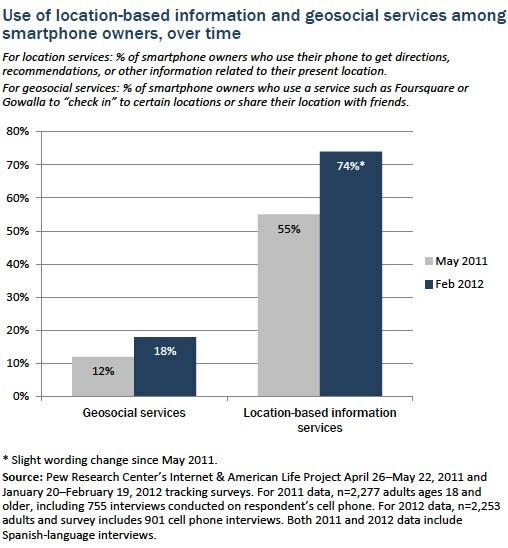 Some 18% of smartphone owners use geosocial services on their phones, up from 12% in 2011. This translates to 10% of all adults as of February 2012, up from 4% in May 2011. 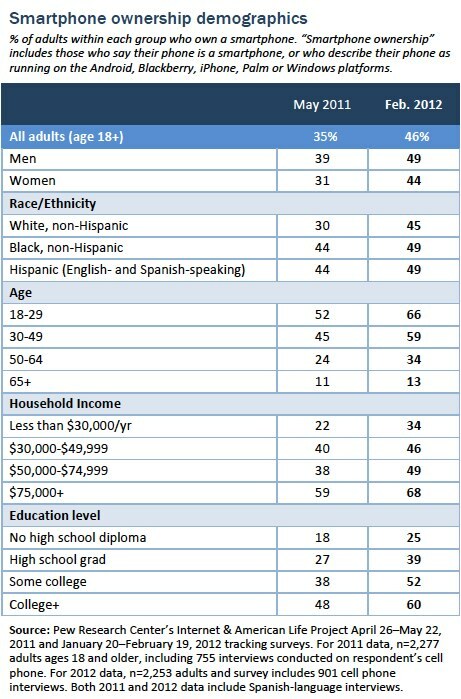 Some 75% of smartphone owners use at least one of these services, as shown in the following table. 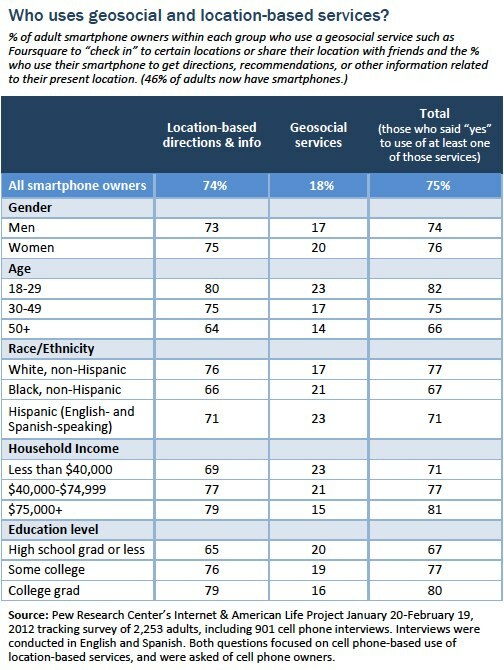 Not surprisingly, nearly all of the smartphone owners who use geosocial services (93%) also report getting location-based directions and information. Among smartphone owners, younger adults are more likely than older adults to use both location-based information services and geosocial “check-in” services. However, while smartphone owners in lower-income households are less likely2 to use location-based information services, they are more likely to use geosocial services like Foursquare. 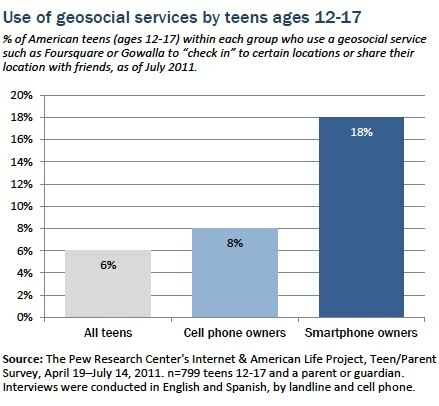 As of July 2011, almost one in five teen smartphone owners (18%) use a geosocial service such as Foursquare. This works out to 8% of teen cell phone owners and 6% of all teens ages 12-17. In general, older teens ages 14 to 17 are more likely to use geosocial services than 12 and 13-year-olds. Smartphone ownership among American adults has risen over the past year. Almost half of adults (46%) now have smartphones, up from 35% in May 2011. Another two in five (41%) have more basic cell phones, and 12% of adults do not own a cell phone of any kind.3 Younger adults are still much more likely to own smartphones than older adults, even compared with older adults with similar levels of education or household income. The results in this report for adults age 18 and older are based on data from telephone interviews conducted by Princeton Survey Research Associates International from January 20 to February 19, 2012, among a nationally representative sample of 2,253 adults, age 18 and older. Telephone interviews were conducted in English and Spanish by landline and cell phone. For results based on the total sample, one can say with 95% confidence that the error attributable to sampling is plus or minus 2.3 percentage points. The results in this report for teens ages 12-17 are based on data from telephone interviews conducted by Princeton Survey Research Associates International from April 19 to July 14, 2011, among a nationally representative sample of 799 teens ages 12 to 17 years old and their parents living in the continental United States. Telephone interviews were conducted in English and Spanish by landline and cell phone. Statistical results are weighted to correct known demographic discrepancies. For results based on the total sample, one can say with 95% confidence that the error attributable to sampling is plus or minus 4.8 percentage points.